In February 1915, the Germans announced they would wage unrestricted submarine warfare on the waters around Great Britain. That meant the German navy intended to attack both military and non-military vessels, like freighters and tankers. In April 1915, they issued notices of their intention in newspapers in Britain and across Europe and in the United States. 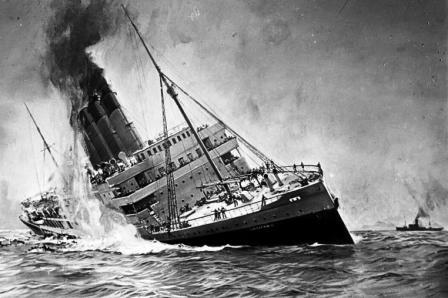 On May 7, 2015, the British luxury passenger liner, the Lusitania, was torpedoed off the coast of Ireland by a submerged German U-Boat (submarine). The Lusitania sunk in 18 minutes. Of the 48 lifeboats on board, only six were successfully launched. Over 1,000 people died. The death toll included over 100 Americans who were passengers on the Lusitania. The outcry was heard around the world. To attack an unarmed passenger ship was against international law. But Woodrow Wilson refused to declare war on Germany in 1915 over the sinking of the Lusitania. He believed it was not a strong enough reason to risk many thousands of American lives should the United States enter the war effort against Germany. However, combined with other actions over the next two years, the sinking of the Lusitania did help to tip the US into joining the war effort in 1917. Great Britain used the sinking of the Lusitania as propaganda, presenting the German people as monsters. This propaganda was designed to encourage support of the war effort. The British even circulated a rumor that German school kids received the day off to celebrate the sinking of the Lusitania. 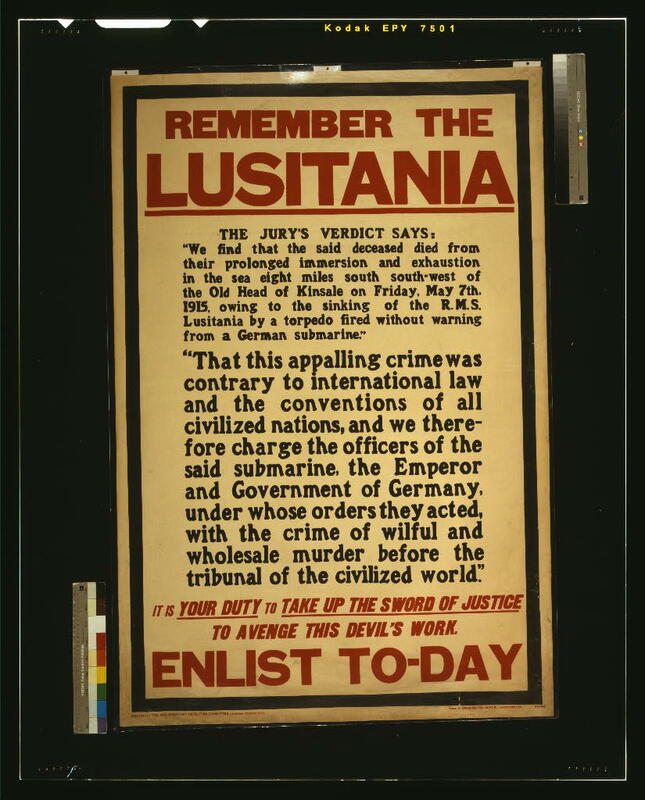 Posters appeared all over Britain - Remember the Lusitania. These posters did not use pictures. They used text and color to present as fact that the Germans had been tried and found to be evil murderers. It was very effective. Many men enlisted. The cry "Remember the Lusitania" was heard all over Britain.